Looks like Brian Urlacher has officially tied the knot – and no we don’t mean with his hair. The Bears legend married former “America’s Next Top Model” contestant Jennipher Frost over the weekend, the Chicago Tribune reports. News of the nuptial began circulating on social media as former teammates and friends posted photos of the ceremony and reception. Urlacher has spoken little about his big day, but re-tweeted a photo from former Bears defensive end Alex Brown. Congrats to #BrianUrlacher and #JennipherFrost! They got married in #PalmSprings over the weekend. 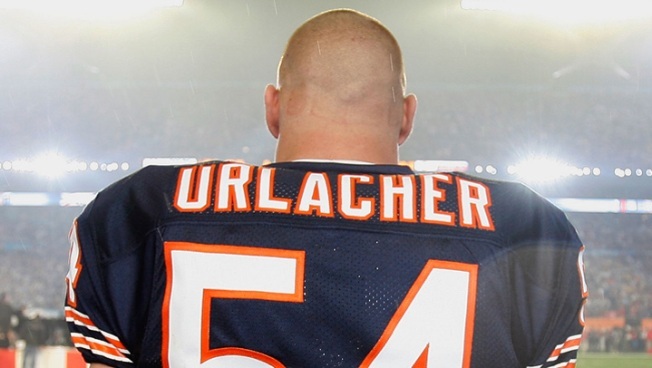 Urlacher most recently made headlines when he revealed a new head of hair after spending 13 years with one of the most well-known bald heads in the NFL. Urlacher’s career with the Bears came to an end after the 2012 season when the two sides couldn’t come to an agreement on a contract extension. The relationship between Urlacher and the organization was decidedly sour after that, with the former linebacker openly criticizing head coach Marc Trestman and GM Phil Emery in his role as an analyst for Fox Sports.